Introduction: Laparoscopic resection of the body and tail of the pancreas for benign lesions is an accepted technique but published series are still few. 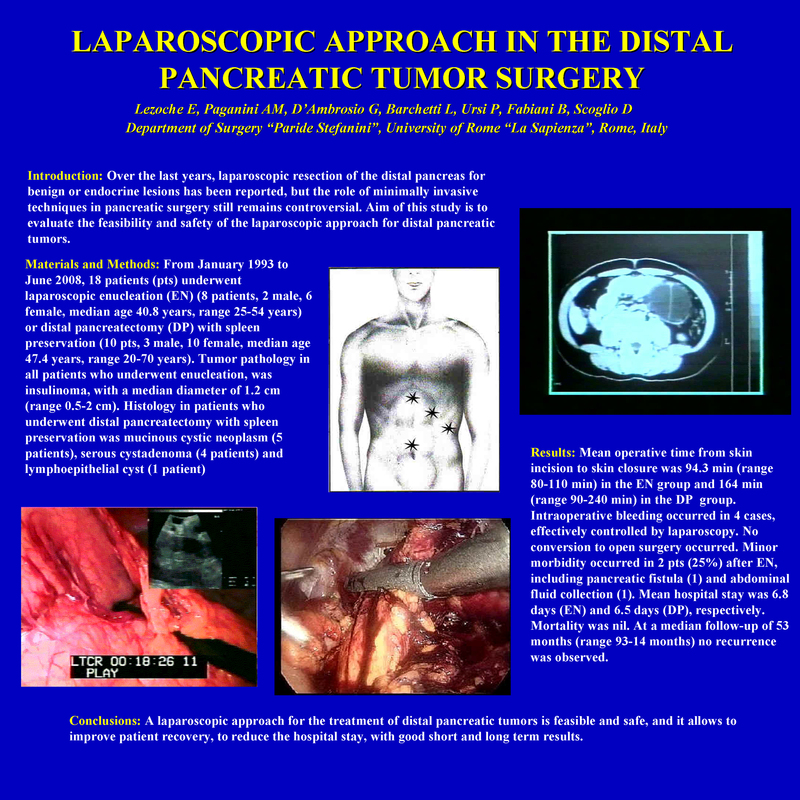 Aim is to evaluate the results of the laparoscopic approach for distal pancreatic tumors. Methods: From January 1993 to June 2008 18 patients (pts) underwent laparoscopic enucleation (EN) (8 pts, 2 males, 6 females, median age 40.8 years, range 25-54 years) or distal pancreatectomy (DP) with spleen preservation (10 pts, 3 males, 10 females, median age 47.4 years, range 20-70 years) in our Department for benign lesions. Results: Mean operative time was 94.3 min (range 80-110 min) for EN and 164 min (range 90-240 min) for DP. Intraoperative bleeding occurred in 4 cases, controlled by laparoscopy without conversion. Morbidity occurred in 2 pts (25%) after EN, including pancreatic fistula (1) and abdominal fluid collection (1). Mean hospital stay was 6.8 days (EN) and 6.5 days (DP). Mortality was nil. Tumor pathology was insulinoma (8, after EN) and mucinous cystic neoplasm (5), serous cystadenoma (4) and lymphoepithelial cyst (1) after DP. At a median follow-up of 53 months (range 3-93 months) no recurrence was observed. Conclusions: In experienced hands the laparoscopic approach for distal pancreatic tumors is associated with excellent results.